Palo Alto Kitchen Hood Cleaning is something that AAA Fire Protection Services takes seriously. We understand why commercial kitchen fire suppression and prevention are so important. With over four decades of fire protection services, we provide Palo Alto and Silicon Valley commercial kitchens with expert services at affordable prices. Our services include the installation and maintenance of restaurant hood fire systems, complete and sanitary restaurant exhaust cleaning, and a comprehensive grease filter exchange service, which helps maintain compliance with fire codes. Under UL300 the requirements for grease hood filters is very strict. The baffle filter design is now the new standard and old mesh filters must be replaced. This is why we offer a grease filter exchange service in conjunction with complete kitchen hood systems. In addition, our grease exhaust cleaning services not only keep your kitchen sanitized, it helps to reduce your risk of fire. We replace mesh exhaust hood filters with baffle - 18-gauge galvanized, UL-listed grease baffle type filters which meet UL300 standards. 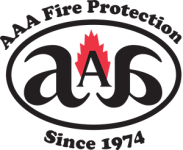 For more information about AAA Fire Protection Services and our commercial kitchen services, just give us a call at (800) 543-5556.